Like karters, bearings are nasty, greasy things that should be cleaned often. We race low horsepower vehicles, so any grit impeding your axle from spinning freely will slow you down. Also, quality bearings go for about $100 each (ceramics closer to $400!) So unless you’re rich and like to go slow, you should clean your bearings at the first sign of trouble. The first step is to determine whether you need to. While your kart is on the stand, grab a rear wheel and give it a good hard spin. If it doesn’t spin freely, but doesn’t make any crunchy-gritty noises, your axle is likely out of alignment and needs to be reinstalled – a perfect opportunity to clean your bearings. If it does make crunching noises and grinds to an abrupt halt, it doesn’t necessarily mean your bearings are dirty. Often times that noise is the rotor rubbing the brake pads, so try pushing the pads all the way open. If you’re still hearing the noise when you spin the axle, Mike from CFMotorsports uses an old mechanics’ trick for isolating the source: Hold the tip of a screwdriver against the caliper and then each cassette while putting your ear to the handle as you spin the axle. If you hear it is a dirty bearing, you might as well clean them all. 2: Try not to mangle the dust covers. a real aqueous or mineral spirits parts washer. Pop off the bearing dust covers from the side away from the axle sleeve. Use a very small/thin blade screwdriver, and be patient so you don’t totally mangle the covers. Using a parts washer, thoroughly clean the bearings, dust covers and cassettes. 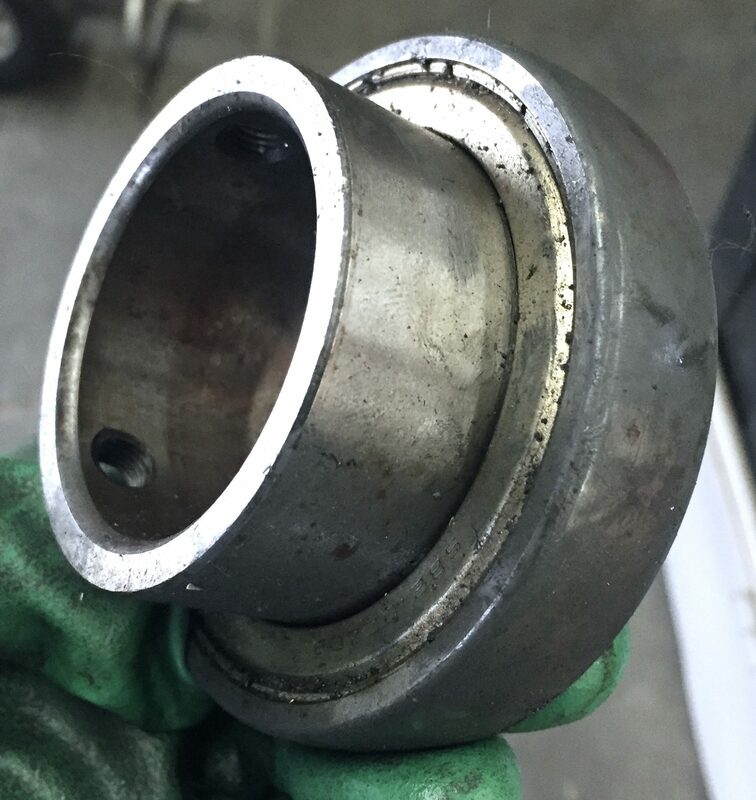 Remember to never allow ungreased bearings to spin… you don’t want to scratch/scuff up the internal surfaces… the smoother those surfaces, the fewer places for debris to cling. 3: Wear gloves so you wash away grit not brain cells. Rinse with water (skip this if washed with mineral spirits.) Blast with compressed air until completely dry – remember, no spinning. If the blown-out water/spirits is tinged, the bearings are still dirty, so clean them again. Cover a work surface with a thick layer of clean rags or paper towels. Arrange the bearings with their open side facing up. Apply a coat of spray grease. Allow to dry/set. 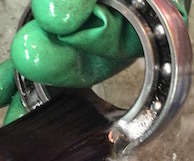 Gently rotate the bearings to work the grease fully onto the balls and races. Respray and dry 3-4 times. 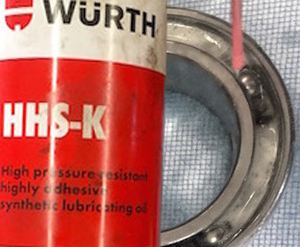 Mike at CFMotorsports uses this great stuff from Wurth called HHS-2000 or HHS-K. While you’re waiting for the grease to dry, carefully reshape the dust covers to make sure they don’t interfere with the bearings as they spin. 4: If this blows out, they’re not clean. Reinstall the dust covers by patiently working them back onto the bearings until you feel them click into place. Refit bearings into the cassettes as squarely/evenly as possible. 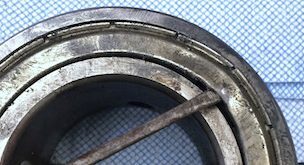 While rain races and off-track excursions will most certainly mess up your bearings, ironically the most likely cause of dirty bearings is cleaning. I’ve found it’s better to allow grit to accumulate on the outside – even form a shell – than to push or wash the grit into the bearings. are much lighter than the correct grease, and thus lift it off and carry it away. In other words, these products wash away all the grease and only the smallest particles, leaving the largest grit trapped behind the dust covers with the now unprotected balls and races. While this may temporarily appear to be an improvement on the stand, as soon as the hard spinning and violent vibrations of racing start, that light oil will be flung off and the trapped grit will destroy the bearings in short order. Sometimes you gotta go slow off track to be fast on track. I guess that’s why they call it the pits. In Part III we’ll discuss the proper way to install an axle.